The Blue Growth Community, driven by the InnoBlueGrowth project (Interreg MED), celebrated its third transnational capitalisation and community building event on the theme of Clusters. The event, entitled “The Cluster approach for a sustainable Blue Growth in the Med,” was held on 20-21 June in Athens. 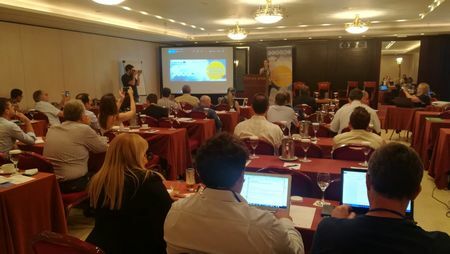 It was organised by the NTUA-School of Naval Architecture and Marine Engineering with the support of the CPMR Intermediterranean Commission (IMC) and the other InnoBlueGrowth partners. It gathered stakeholders ranging from higher education & research institutes to SMEs, sectoral agents, business support organizations, and the Private sector. The workshop had a dual approach. The first day was focused on Capitalisation Activities of Maritime Surveillance in the Mediterranean area with as a leading actor the PROteuS project. PROteuS aims at exploiting the growth potential of the emerging Maritime Surveillance industry that can play a crucial role in the socio-economic development of the Mediterranean area and in the generation of new job opportunities, through the creation of a “Cluster of Clusters.” This new cluster would be composed by National Nodes operating in Mediterranean countries (Italy, Spain, France, Portugal, Greece, Cyprus). The need to provide qualified and skilled personnel through education & training for market development. Among the highlighted points were the impacting contribution of the Hellenic Coast Guard, presenting the aspects of Maritime Surveillance though a memorable video depicting its different aspects such as sea rescuing for migrants, policing for illegal substances traffic smugglers, monitoring boats in wreck danger, and pollution threats for the environment. The debates that followed focused on migration and cyber security vulnerability. They concluded on the demand to establish a clear harmonized policy & regulatory framework for strategic actions, in order to facilitate the growth and development of the maritime surveillance sector. Following the debates, the last session focused on the strength that derives from knowledge creation and knowledge capitalization. “A lack of awareness could potentially create serious threats.” In the digital transformation world, new skills, training, scientific and technological expertise are major components, supporting the new era of a holistic maritime eco-system. The possibility of cooperation and competition in the Mediterranean level was afterwards presented by the PELAGOS project and the newly launched Online Platform of the Blue Energy Cluster, www.be-cluster.eu; a platform that offers a unique opportunity to the members of the Blue Energy Cluster to promote their organizations and it includes some of the most innovative and influential organizations in the field of Marine Renewable Energies in the Mediterranean region that will shape the face of the industry. Among the very interesting questions raised during debate was the query “does a cluster need governance?”, highlighting that since the legal statuses of clusters are diverse, governance dynamics do not have a specific scheme and no specific “governance models” are therefore to be preferred so far. Participants also discussed issues such as funding resources for a cluster, how to choose an appropriate partner, the importance of governance and the contribution of a cluster in sustainable development and economic growth. Among the highlighted issues suggested, was to include the environmental helix in the process model, as environment can be a driving force for the future policy-makers. A more technical and policy report will be published soon following this event and on the road to the InnoBlueGrowth mid-term event, to be respectively celebrated next November 2018 (22-23) in Barcelona (Spain). For more information on InnoBlueGrowth, check out the website of the Blue Growth Community or get in touch with elodie.nunes@crpm.org. Also join us on professional LinkedIn account, Facebook and Twitter!